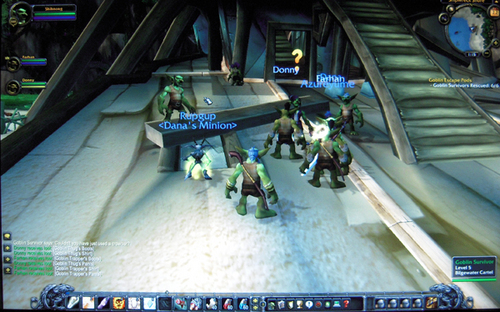 The gameplay trial at Blizzcon for WoW: Cataclysm only displayed the new starting areas for the Worgen and the Goblins. I only tried the Goblins area, and it was vibrantly lush. Gameplay wise – nothing new in WoW. Some interesting quests were implemented like becoming a Goblin Weedwacker. It doesn’t feel any different, which is a good and bad thing. With a game like WoW, differences cause people to complain (Blizzard always bashes on Ret Paladins whining on the forums for every change). But at the same time, with something as large as Cataclysm, I’d expect some heavy changes. Unfortunately, these changes are mostly to the world design and quest locations. Graphics are the same as the Lich King except with the inclusion of terrain phasing, which I did not run into during my short time with the game. So far, Cataclysm’s new area won’t bring anything new gameplay wise to WoW. Blizzard did say they want each new area to have a great story and an amazing cutscene that rivals the Wrathgate. Best part: Watching my Goblin rocket jump forward. Worst part: Landing with the Goblin and having to wait a moment before running again. Actually It is interesting to reach this page since I saw that this post is obviously one great place where I can find lot of useful info about code.Keep it up in the next article. No doubt that it is an amazing game as the gameplay trial at Blizzcon for WoW.